It is a well established fact that the organized Jewish community and radical Jewish perverts have been and remain in the vanguard of the promotion and celebration of homosexuality, "gay marriage", and transgenderism throughout the Western world. Indeed, Jews have always promoted sexual debauchery and degeneracy, resulting in the now widespread social acceptance of sexual promiscuity, homosexuality, and all forms of licentious, immoral, and unnatural behavior. Meanwhile, over in Israel, the Jewish Telegraph Agency is reporting that - once again - a fanatical Orthodox Jew has violently attacked individuals participating in the gay pride parade in Jerusalem. Incredibly, the man accused of stabbing six gay pride activists today is the same man who was arrested and convicted of stabbing three individuals at the gay pride parade in 2005. 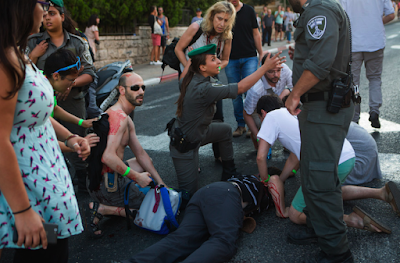 Six marchers were stabbed at Jerusalem’s annual gay pride parade — allegedly by the man who stabbed three people at the parade in 2005. One victim in Thursday’s stabbings was in critical condition and two were in serious condition. The alleged assailant — Yishai Schlissel, a haredi Orthodox man from Modiin Ilit in the West Bank — is in custody. He reportedly used a kitchen knife. Schlissel was released from prison two weeks ago for the previous attack, according to the Jerusalem Open House for Pride and Tolerance. Upon his release, he reportedly distributed pamphlets that called on “all Jews faithful to God” to risk “beatings and imprisonment” in order to stop the parade, according to Haaretz. The injured were treated on the scene before being evacuated to local hospitals. Thousands participated in the 14th annual Jerusalem March for Pride and Tolerance, which went through the center of the city. The parade continued after the violence, with hundreds of police and Border Police officers placed along the route to protect the marchers. Of course, the organized Jewish community, in all its various manifestations, does not operate as a monolithic entity, except when it comes to the most important issues central to the advancement of global Jewish interests (i.e., the fake "Holocaust" narrative and the multi-billion dollar industry that supports and perpetuates this entirely false depiction of history). Issues of lesser importance to the organized Jewish community, such as gay marriage and homosexual rights, are often heatedly debated within the Jewish community. Orthodox Jews typically do not support homosexual rights and gay marriage, especially amongst Jews and in the Jewish state of Israel. However, the Jewish community has promoted homosexuality and gay marriage in the West in an effort to undermine, erode, and ultimately destroy the basic moral, sexual, and familial foundations our civilization was founded and built upon. And they've been very successful. This past Tuesday, I was a guest on The Truth Traveler with host Erin Dakins, which broadcasts on the Genesis Communications Network. Erin and I discussed the popular blog article I published in March entitled Dear White People, the Jewish assault on Western civilization, Donald Trump's presidential candidacy, and the war on White people worldwide. You can download the first hour here and the second hour here. I joined Scott Roberts last night to discuss a variety of subjects relating to Donald Trump's presidential candidacy. This is a much watch folks! The fact that the FBI makes all of its agents visit the "Holocaust" museum tells you everything you need to know about who runs America. Abe Foxman has officially stepped down as National Director of the Anti-Defamation League after leading the organization for the past few decades. Jonathan A. Greenblatt, who we will learn more about in the near future, began his tenure as National Director yesterday. The ADL is widely regarded as one of the most subversive, un-American anti-White hate groups operating in the United States today. In a letter written to supporters of the ADL, Foxman recounted his long history of involvement with the Jewish supremacist, anti-White hate organization, along with its achievements. Foxman's letter is rather revealing, as it confirms what many "anti-Semites" (individuals who make basic, factual statements about Jews, Israel, and Jewish power and influence in the West) have been saying for years now: Jews have amassed so much political, financial, and cultural power in the West, largely through their ownership and control of mass media and influence in academia, that they now enjoy a unique sense of security and privilege, with their actions, behavior and overall agenda being strictly off limits to open debate or criticism. As I prepare to transfer the leadership of the Anti-Defamation League to the next generation, I am profoundly grateful for the opportunity I’ve had to live a life of purpose through my work for ADL. I came to ADL exactly 50 years ago, fresh out of law school and fueled with passion to fight for the safety and security of the Jewish people. As a child of the Holocaust who was hidden by my Polish-Catholic nanny and then miraculously reunited with my parents, I chose a mission to ensure that what happened during World War II would never happen again. The experiences of my childhood coupled with the lessons my parents taught me inspired a lifelong commitment to fighting anti-Semitism and all forms of bigotry and oppression. I also owe a great debt of thanks to you and to the generations of ADL supporters whose generosity and partnership helped build ADL into the highly respected and influential organization it is today. Together, you and I—and so many others—have improved the world in significant and lasting ways. Freeing America from the economic, political and social restraints of anti-Semitism is without question ADL’s most remarkable achievement. During my tenure, ADL strengthened and sustained the sense of security and inclusiveness that Jews in America uniquely enjoy—particularly by expanding our reach internationally and across religious and ethnic lines. Foxman essentially concedes that the ADL is an enormously powerful and influential organization operating at an international level, lobbying various governments to promote policies that advance Jewish ethnic interests. As Foxman correctly argues, the ADL has been instrumental in "freeing America" from "anti-Semitic" attitudes, not through legal means, but through social, economic, and political means. Discussing the subversive, destructive nature of Jewish power and influence in the West (i.e., "anti-Semitism") is a social taboo in America. Additionally, the ADL has "strengthened and sustained the sense of security and inclusiveness that Jews in America uniquely enjoy," Foxman notes. An incredible display of Jewish power and influence, no doubt. Critics of Jewish power, and the manner in which it is wielded in the West to promote White displacement, disenfranchisement, and demoralization (i.e., White genocide), have long argued that organized Jewry uses ethnic, religious, and sexual minorities (homosexuals, transgendered individuals, etc.) to advance specifically Jewish interests while feigning compassion for others. Jews have been in the forefront of various social justice causes throughout American history, particularly the "Civil Rights struggle" and "homosexual rights" campaign (which includes gay marriage), ostensibly to promote "equality" and "tolerance". In reality, the Jews involved in these causes are involved primarily to advance specific Jewish interests. It is truly incredible how the organized Jewish community, through their various organizations, spokesmen, leaders, and newspapers, openly admit and even boast about their power and influence in the West, their subversive, anti-White accomplishments and overall agenda, and astonishing success in advancing ethnic Jewish interests at the expense of the ethnic interests of the host nation they reside in. If you dare point any of this out, however, Foxman and the ADL will be the first to denounce you as an "anti-Semite" and a "bigot". Congressional votes on the deal, which got a rough initial reception from Republican lawmakers, were not expected until September. Regardless of Israeli lobbying, however, odds were slim that U.S. lawmakers would be able to derail the deal. AIPAC has 11 registered lobbyists in Washington and spends about $3 million a year on lobbying, according to the non-partisan Center for Responsive Politics, a watchdog group that monitors lobbying expenditures and campaign finance. AIPAC is widely viewed as the most influential group in the United States advancing the Israeli government’s agenda. “Few lobbies dedicated to international issues are so active and well-financed as the Israel lobby,” the center said of pro-Israel organizations generally. Some of the lobbying will be aimed at Jewish members of Congress, who will be influential voices in the upcoming debate. Two of them are so far withholding judgment: Senator Benjamin Cardin, the senior Senate Foreign Relations Committee Democrat; and Senator Charles Schumer, the No. 3 Senate Democrat. Besides lobbying, 2016 political campaign contributions to members of the U.S. Congress are expected to be dangled. In 2014, pro-Israel groups contributed $11.9 million to congressional candidates, with $6.8 million going to Democrats and $5.1 million to Republicans, according to the center. Among the top recipients were Senate Majority Leader Mitch McConnell, Senator John Cornyn, the No. 2 Senate Republican, and Representative Steny Hoyer, the No. 2 House Democrat. Meanwhile, Sheldon Adelson, a U.S. billionaire businessman and outspoken critic of the Iran negotiations, could also use his vast financial resources to try to influence Congress. According to professional Jewish advocates, such as Abe Foxman of the Anti-Defamation League, the very idea that there is such a thing as "the Israel lobby" or that it wields enormous, dominating influence in Washington, DC and American politics generally is an "anti-Semitic canard." And yet here we have a well-established and respected Jewish newspaper - The Jewish Daily Forward - openly reporting on the network of pro-Israel political lobbying organizations, along with a number of plutocratic Jewish billionaires who finance and fund the election campaigns of major political candidates (especially at the presidential level), who are determined to undermine and derail the internationally negotiated deal with the Islamic Republic of Iran. The Jewish state of Israel and its international network of advocates and partisans are determined to undermine any sort of peaceful, respectable, and diplomatic solution to any of the problems between America and the wider Western world on one hand, and the Islamic world on the other. The Jewish strategy of the 21st century is to pit the West against the Islamic world in a never-ending "clash of civilizations," where the American military and her NATO allies are to be engaged in a "Global War on Terrorism" - a paradigm of foreign policy conjured up entirely by Jewish intellectuals and Israeli military and geopolitical strategists in the late 1970s - against a faceless, manufactured "enemy" known as "radical Islam" in an effort to advance Israel's geopolitical agenda in the Middle East. 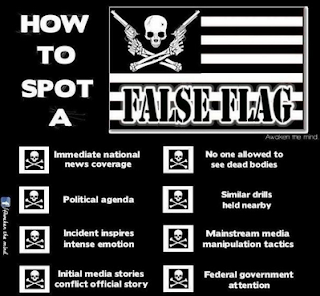 Unfortunately, this Jewish strategy has been highly successful, especially following 9/11, a false flag attack organized and executed by Jewish criminals in key positions of power and influence in the American government and mass media, an event that was used to initiate and institutionalize the fraudulent "Global War on Terrorism". It is past time that the American people recognize these basic facts. Tuvia Tenenbom: Let me ask you, is the state of anti-Semitism better or worse after the last 28 years since you became national director of the ADL? Or the last 50 years? Abraham Foxman: The answer is “yes” to both. On one hand it’s better and on one hand it’s worse. I’d say that in the United States it’s significantly better; it’s gotten better in the last 50 years. In this country, when I started, for example, the level of anti-Semitism as measured by attitudes was about one-third; one third of the American public in the ’50s was infected by anti-Semitism. Today, America is not immune, but the level of anti-Semitism is about 10 to 12%. It’s still pretty serious, because it means that 35, 40 million Americans are seriously infected with the disease of anti-Semitism, but legislation, litigation, education, all of these things, cumulatively, have had an impact. But I think probably the most important thing is that in this country, our laws permit you to be a bigot, an anti-Semite. In Europe you have laws against anti-Semitism, not here. Why? Because in this country, even though the law says you can be a bigot, the pressure of society is such that there are consequences, public consequences, to being an anti-Semite. Here, if you are in business and you engage in anti-Semitism, you’re not going to succeed very much. You remember Mel Gibson? He was a great hero of Hollywood: the best producer, the best director and the best actor. And he revealed himself as an anti-Semite. He went all the way down. Not because of legislation, not because of litigation, but because the American people reject this. But this rejection started with legislation, correct? If the ADL did not exist, do you think the level of anti-Semitism in this country would be the same as it is now? This is for somebody else to say. There’s no question in my mind that it would’ve been worse. If I did not believe that I could change people’s minds and hearts I wouldn’t go to work. I wouldn’t raise my voice. So, it’s a question of faith. I believe that if we in the ADL, the American Jewish Committee and other institutions didn’t act, it would be worse. How much worse? I don’t know. I see in Europe how much worse it can be, even with legislation. In Europe it’s worse today than it’s been since World War II. It’s not like in World War II, because the governments of France, Germany, Holland, Great Britain speak out publicly, but in terms of measurements, of attitudes, it’s the worst it’s been since World War II. In Europe we’re talking about the rise of anti-Semitism in the last 20 years. Is there a rise of anti-Semitism in America as well in the last 10, 20 years? No. If anything, it has declined. While in Europe, anti-Semitism has gone up, here it has come down. What’s the origin of anti-Semitism? Tuvia, bigots see what they want to see! If you look at the issue of anti-Semitism, they believe that the Jews control: They control banks, they control finance, they control government. I know what they say. But explain to me the “jealousy” part. Are Jews really smarter than other sects or groups? There are several points worth making about Foxman's responses to Tenenbom's questions. First off, we see that Jews view "anti-Semitism" as a "disease" that can "infect" a society. Of course, Jews would have you believe that they themselves have nothing to do with "anti-Semitism". "Anti-Semitism" and genuine anti-Jewish sentiment, according to Jews like Foxman (whose views reflect the wider organized Jewish community), is fundamentally irrational and unfounded. "Anti-Semites" are misguided, deranged, and pathological bigots who blindly "hate the Jews" merely because they are Jews. Jews are, and have always been, a "persecuted people" who are scapegoated and discriminated against for no good reason. Nothing could be further from the truth: "anti-Semitism" and genuine anti-Jewish sentiment is always a direct result of Jewish chicanery, treachery, subversion, and criminality. Secondly, in their on-going efforts to "treat" and combat the "disease of anti-Semitism" which has historically "infected" and plagued Western society, organized Jewish institutions such as the Anti-Defamation League have lobbied for legislation designed to criminalize and neutralize manifestations of "anti-Semitism". "Tolerance" and "multiculturalism" - two key pillars of post-WWII America (and the wider Western world) - are promoted by Jews in an effort to combat and neutralize "anti-Semitism" and "racism," thus facilitating Jewish exploitation and dominance of their host nations. Aside from legislation, Jews have also used litigation, educational programs, public relations campaigns, and marketing to combat "anti-Semitism". For example, the "Holocaust" industry is a very effective public relations and marketing campaign designed to advance Jewish financial, political, and cultural interests while "combating anti-Semitism" in the process. As Dr. Kevin MacDonald has persuasively argued, the "Holocaust" has become "the central moral icon" of Western civilization due to Jewish lobbying and ethnocentrism. In the West, especially America, Jews have been quite successful in combatting "anti-Semitism" via non-legal means. As Foxman notes, there are very real consequences for publicly taking an "anti-Semitic" stance in America. 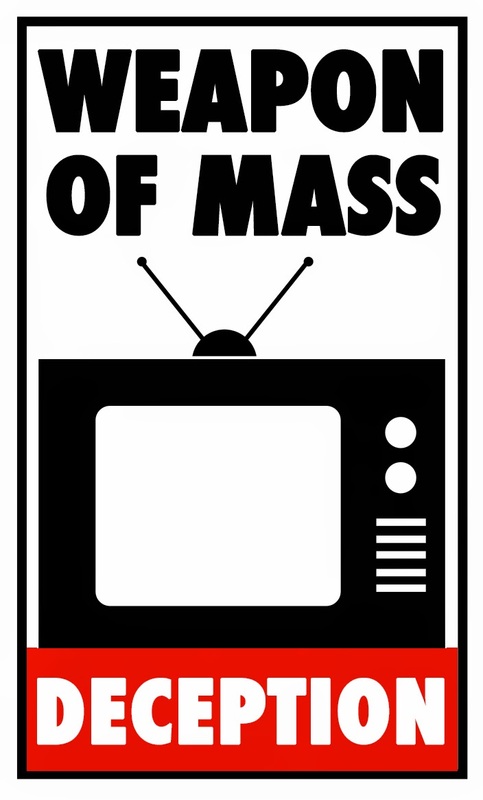 "Anti-Semites" regularly find themselves ostracized from society, boycotted and shunned, and even publicly persecuted and assailed by the mass media and political establishment. "Anti-Semites" are often financially ruined, blackballed, and fired from their jobs, simply for expressing a point of view found offensive by the organized Jewish community. None of these reactions to "anti-Semitism" are enforced by the state; rather, they are organic social manifestations directly related to effective Jewish activism, public relations, and propaganda. Finally, while Foxman and other Jews always claim "anti-Semitism" is fundamentally irrational and pathological, in this interview he essentially admits "anti-Semitic" sentiment is a direct result of "jealousness" of Jews as well as their "success" and control of banking, finance, and government. From my own personal perspective, I am not "jealous" of Jewish success, intelligence, or their various accomplishments. "Jealousy" of the Jews does not drive my "anti-Semitism". Rather, I am "anti-Semitic" because of the subversive and destructive nature of Jewish power and influence in the West, coupled with their outrageous hypocrisy and criminality. I am an "anti-Semite" because I understand and recognize the true nature of the Jews, as well as the reality of Jewish power and influence over virtually every aspect of political, economic, and social life of the West. And I believe most "anti-Semites" would agree with me. "Hurray, hurray! Finally!" 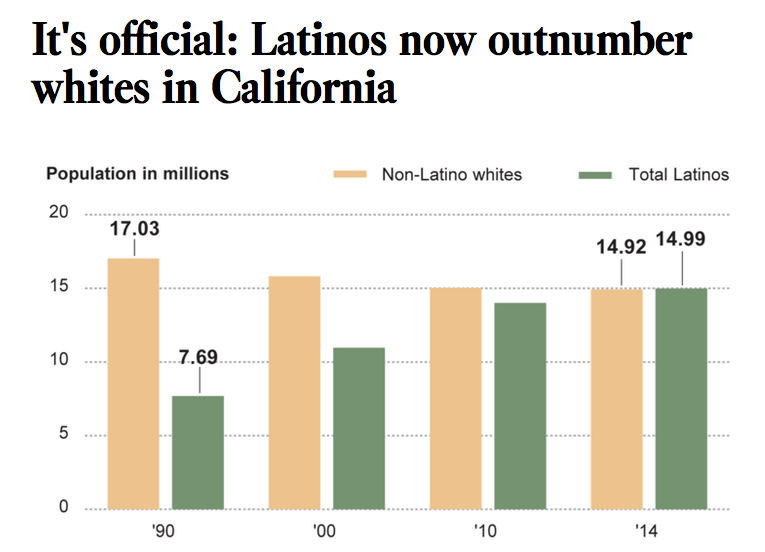 the anti-White, anti-American, Jewish-instigated Marxists and their supporters shouted following the official announcement: "Latinos" (or, as the always insightful and powerful author of Modern Heretic puts it, "la-teen-ohs") have officially displaced White Americans in California. And what are White Americans* supposed to think about this latest development in their on-going, and quite blatant, demonization and displacement in the very land their ancestors worked so hard to build for them? Well, of course, they are excepted to rejoice and celebrate their racial displacement and destruction. Whites are simply assumed to meekly accept their own racial displacement in one of the most beautiful and productive states in the entire United States - a state that their ancestors and racial kinsmen founded, built, and developed through their hard-work, ingenuity, perseverance, sacrifice, and good fortune. 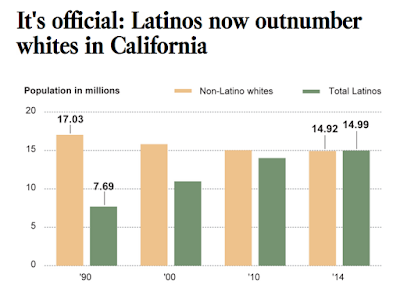 California went from being more than 75% White in the 1970s to a White racial minority status in 2015. Think about that folks. No one voted on this development. The people did not approve it. The hostile elite who illegitimately and criminally govern this state and nation did. They are responsible for this outrageous situation. Does racial displacement and destruction (i.e., genocide) take place in any other country, aside from the United States and Western Europe? Can there be any doubt at this point that the entire Western political and media establishment - which is, to be frank, totally controlled by Jews - is fundamentally driven by a desire to utterly annihilate the White race and the nations and cultures we've founded and built over the centuries? * Truth be told, the only real, authentic kind of Americans there are, considering the racial group that settled, built, founded, and developed this once great nation, including the state of California, are those of White European descent. The racial and ethnic nature of American identity - what it really means to be an American - has been subversively transformed and distorted over the years by radical anti-White Jewish Marxists, such as Emma Lazarus, Israel Zangwill, and many others. America went from an exclusively White European nation to a "proposition nation," where any scoundrel could magically become "an American citizen" simply by paying some fees and declaring "an oath" to this once proud nation. Now days, those superficial measures are not even worthy of respect - illegal aliens have been flooding our nation for years! What a disgrace! A Sacramento rabbi has called on Amazon to ban the sale of books promoting Holocaust denial, CBS Sacramento reported on Friday. Among the books for sale to Amazon customers are titles such as Did Six Million Die? The Truth at Last and The Myth of the Extermination of the Jews. The latter title is only available for Amazon’s Kindle device. In the modern day Jewish tyranny known as "America," questioning anything the organized Jewish community says or does is unacceptable. 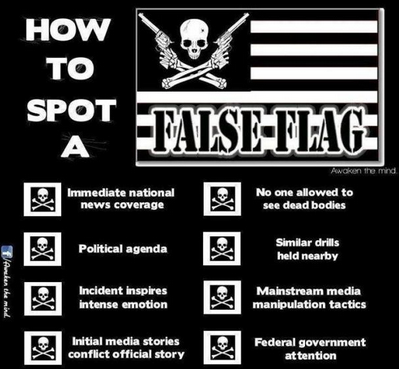 Publishing well-documented and scholarly books thoroughly debunking every single aspect of the fake Jewish "Holocaust" story, as well as other fraudulent events in recent history (such as 9/11), will soon be illegal and certainly unmarketable, assuming the Jews get their way. And the way things are going, it looks like they will get their way. It's simply astounding to me, even to this day, how entirely contrary Jews are to traditional Western civilization. No matter how obvious it is, the masses still cannot grasp how utterly alien and hostile these people are towards our political and cultural traditions. When was the last time you heard of a White Christian man calling for the banning of a certain idea or product (that wasn't entirely subversive and degenerate)? It is just not in our nature to do things like this. Only a Jew would be so cowardly as to call for the banning of scholarly material he did not like or want known to the masses. According to a recent report published in the Jewish Telegraph Agency, Jewish billionaires George Soros and Haim Saban, two of the most politically influential plutocratic internationalists swaying American elections on the Democratic side of the political spectrum, have donated $3 million to Hillary Clinton's 2016 presidential campaign. Other wealthy Jewish plutocrats have followed suit, greasing the wheels of the Clinton campaign. Jewish billionaires George Soros and Haim Saban reportedly have donated a total of $3 million to the presidential campaign of Hillary Rodham Clinton. Saban, an Israeli Hollywood mogul, has given $2 million to Priorities USA Action, Clinton’s super PAC, while Soros, a Hungary-born business magnate, has donated $1 million, according to a Politico article published Thursday. Clinton’s super PAC, which is dedicated to airing ads supporting the Democrat’s bid for the 2016 presidency and attacking her opponents, revealed Thursday that it had raised a total of $15.6 million during the first half of the year. Other heavy donors included DreamWorks Animation CEO Jeffrey Katzenberg and director J.J. Abrams and his wife, Katie McGrath, as well as California investor Herb Sandler and Boston philanthropist Barbara Lee. The non-existent "Iranian threat" is shaping up to be one of the biggest issues in the 2016 presidential campaign for the organized Jewish community and Israel-first crowd dominating American politics. Being the bloodthirsty, fanatical war-mongers that they are, they are doing everything in their power to prevent a rational and respectful diplomatic resolution to the outstanding issues between the Islamic Republic and the West. The organized Jewish community and pro-Israel lobby, not to mention the Jewish state itself, desperately want war with Iran. Needless to say, Americans will be once again supplying the capital - human, military, and financial - required to wage this war on Israel and international Jewry's behalf. In an effort to please her Jewish masters and convince them that she's sufficiently pro-Israel and pro-war (pro-Israel and pro-war are essentially synonymous when it comes to American political discourse), Clinton has been hyping the purported threat to Israel and the wider Western world emanating from Tehran while on the campaign trail. Back in May, Saban explained to The Jerusalem Post that he viewed Clinton as "the ideal candidate for Israel," demonstrating not only how ethnocentric Jews are, but also how openly hostile they are towards the host nations they reside in. They are more concerned about Jewish interests and the Jewish state of Israel than America, and they make no bones about it. Jewish billionaires and other plutocrats openly use the American political system and mass media to promote their own agenda and to advance their own unique ethnic interests. Meanwhile, the American people continue to support candidates and political parties that are entirely traitorous and subservient to a hostile foreign entity (Israel) and people (Jews). Matthew Heimbach, a respectable, courageous, and dedicated young pro-White activist, recently announced the creation of The Traditionalist Worker Party, which sounds promising. He elaborated on the Party during a recent episode of Trad Youth Hour that I highly recommend listening to. We absolutely need an independent political party outside of the controlled and traitorous Republican and Democratic parties if we are ever going to address the problems plaguing America. Earlier this evening, I was a guest on Radio Wehrwolf with Dion, which aired live on Renegade Broadcasting. In this rather informal, laid-back interview, Dion and I discussed the alleged shooting at a historic Black church in Charleston, South Carolina and the anti-White political and cultural agendas being promoted and advanced as a result. We delved into a number of related and unrelated topics as well. You can download the full program here.